So Dusk and I got back from club Patronaat in Haarlem, Netherlands last night but the glow still hasn't worn off. I've been wanting a gig like that for some time and I found it. It was kinda like our DMZ or Dub War set from last year: just pure pleasure. We could hear perfectly to mix and people seemed into what we were doing no matter what we threw at them, so we did. 2step, wonk, grime, techy stuff, soul refixes, jungly beats and this weird new roller I've just finished: everything seemed to be well recieved. Ingmar, Ramadanman and the Dub Infusions massive, we salute you. Then we returned to play Fabric with Luke Envoy and Kutz. UPDATE: check Dub Infusions own videos of the night here and here. Dusk + Blackdown Rinse FM January '09 - download it here. 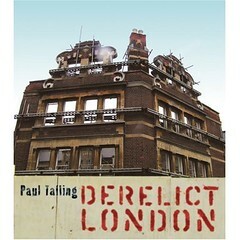 I got this book, Derelict London by Paul Talling for Christmas. And while that already seems like a long time ago, this book increasingly feels of the moment. While every other advert seems to tenuously mention the credit crunch before going on to try to sell you something painfully unrelated, Derelict London was probably written during prosperity. It will soon have a whole new books worth of failing buildings to document. I first found the Derelict London site when searching for images to illustrate pieces about decay. But good on Talling for actually converting the site into a cool, pocket size book. Each page shows a different abandoned building within London: the facing page provides the context and some interesting, anecdotal history. Some buildings are ordinary, some are extraordinary. Some are familiar, others sit hidden in familiar places. The book is grouped into nine chapters, which aligns the buildings along themes. Derelict London is a wealth of nuggets. There’s a building in Whitechapel where Stalin stayed the week the Bolshevik’s consolidated their power. There’s a bricked building Dusk and I walk near on the way to studio that I must have seen hundreds of times in the last 15 years. I had no idea it was a Second World War bunker for 8,000 people. There’s disused Tube stations, dumped Russian tanks and abandoned railway lines that was the site of an accidental First World War TNT explosion that killed 400 and damaged 70,000 properties. Then there’s the reason why the Arsenal football team are called Arsenal and why they play in red. And I discovered why the skyscraper I saw on 2007 London Open House weekend had to be demolished floor-by-floor from the bottom up. Lots of the histories of the buildings are added to with anecdotes and folklore, part from interviews at the location and part from the community on the Derelict London site. In this way Talling was told how in 1977 someone at the bar of the Tidal Basin Tavern was shot dead by a shooter who just stuck his head through the doorway. Similarly on site at Kings Cross’ distinctive Lighthouse Building (you can’t miss it from the Scala, where the recent Why? Not dubstep rave we played at was held), squatters relayed to Talling how if you go into the basement and then down a staircase of the Lighthouse, you found yourself on a disused tube platform. Ultimately though, many of the pages end with the words “converted into apartments.” The economics of redevelopment have become an all pervading force in London this decade, as the relentless growth of the housing market continued. Club after club closed under the pressure of the profits to be made from converting music venues into flats. In recently memory London’s lost The End, the Astoria, Turnmills and literally dozens more. Yet the credit crunch, which happened after this book was written, might just have stopped the developers in their tracks. There’s talk of the funding for The End’s redevelopment having run out, as lending in between banks and creditors dries up. High unemployment is undeniably bad, but it often means passionate, heartfelt music is created. Who knows, maybe London, starting with The City, will become a ghost town, all the clubs closing down? If so, at least Paul Talling, originally himself a music promoter, will be around to record it.